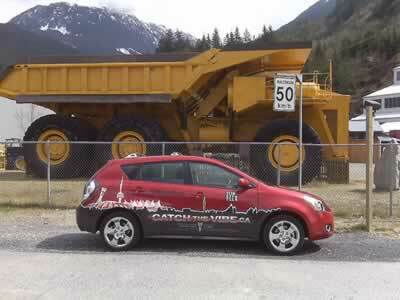 It was also an interesting way for GM to get nearly 100 journalists, bloggers and folk like me to chauffeur rolling billboards for the 2009 Pontiac Vibe around three Canadian cities in an adaptation of the scavenger hunt theme. It was a good way for us to experience the new Vibe under "real world conditions" - and it was a nice, albeit very brief, free trip that gave me a chance to phone my prodigal son without long distance charges. The folk at GM invited me to participate in the Vancouver leg of the challenge (thank goodness I didn't have to visit Toronto! ), which meant flying in on Wednesday, being wined and dined, and the following morning being given our assignments punctuated by a quick "virtual bum pat" (actually, they wished us luck) as we were sent on our way. My partner in Vibe, Gerry, has lived in Vancouver for many years and came equipped with a good sense of humor as standard equipment, so I really lucked out there. Our challenges ran the gamut of easy stuff like bringing back four empty cups from fast food restaurants to shooting - and uploading to the website via the Blackberrys with which we'd been issued - a video of one contestant making and serving a Pontiac logo-decorated (or is that desecrated?) Cappuccino to some poor, unsuspecting citizen, and another video of both partners playing beach volleyball. Sports? Moi? I think not; I didn't become a writer to expend physical energy, and as it turned out there wasn't time to attempt such a non-sedentary folly anyway. We were hard pressed to finish every other task assigned, run up the required 200 kilometers on the Vibe, and make it back downtown to the hotel by 5 p.m. (after which time I was rushed out of the building and taken to the airport - probably to get me out of town before I could do any more damage). We tried the Cappuccino video gambit first but, after being refused twice by shop keepers who didn't see the benefit in having two complete amateurs annoy their hard-won client base, decided to pursue more attainable goals. So we hopped back into our Team Flex all wheel drive Vibe and headed for greener pastures. One of the first was City Hall, where my partner parked the Vibe (illegally, I think) and I ran in to find some letterhead with the Vancouver logo on it. Since I'm with the media and therefore all-powerful and all-important, I marched right into the Mayor's office (well, not his actual office, but the overall facility that makes up the Mayor's office) and convinced them I should be entrusted with the Mayor's personal stationery. That was how the day went - one of us driving the getaway Vibe while the other went into some innocent business or office and browbeat some unsuspecting human being into giving up a valuable document (such as a takeout menu with the establishment's address on it, or a printout of the rules of ethics for transit riders) or to take a picture on the Blackberry of us standing in front of the world's largest tin soldier or some such tourist attraction. It was a great way to get the feel for the Vibe, a nice little wagon redesigned for 2009. I know the Vibe well; my best friend is on his second Vibe and the car serves him nicely. For 2009, the Vibe features six air bags and active head restraints (you should have seen how they restrained my partner's active head! ), as well as four wheel disc brakes with ABS and StabiliTrak electronic stability control, traction control, OnStar, and a Tire Pressure Monitoring System that, if it's like others I've tried, will be completely useless when it gets really cold..
That's a lot of standard stuff for what began life originally as kind of a "Corolla wagon on steroids" (GM calls it a "compact crossover"), but far be it for me to complain about adding value to an already compelling package. The basic Vibe is motivated by a 1.8 liter four cylinder engine with a five speed manual transmission snapped onto it; a more potent yet (according to GM) efficient 2.4 liter engine is also available. My Team Flex had the larger engine (which is standard on the AWD and GT models) though, much to my initial chagrin, it was saddled with a four speed automatic - but later I was glad not to have been shifting all the time when tooling around in strange urban locations full of stop-and-go situations. The 1.8 liter four banger puts out 132 horsepower and 128 lb.-ft. of torque, neither of which will set the world on fire but which should be perfectly adequate if you don't live in the mountains. I was glad to have the 2.4 liter unit and its 158/162 horses/lb.-ft. to handle the ups and downs of our tour de farce, which took us up a winding mountain highway toward Whistler, site of the Alpine events for the 2010 Olympic Winter Games. Even though most of the time we were hamstrung by construction and traffic woes, when we did have a chance to open it up, the Vibe responded well. Even the bigger engine doesn't turn the Vibe into a sports car, but it doesn't pretend to be one anyway. GM makes other transmissions available for the 2.4 liter engine-equipped base or GT models: a standard five speed manual or a new, five speed electronically controlled automatic featuring Driver Shift Control (DSC) which the company says delivers "a great combination of performance, fuel economy and smoothness. With DSC, the driver can manually select gears via tap up/tap down controls." Wish we'd had that! "Manual" control is wonderful on a twisty road, though the four speed performed okay. Shifts were smooth and efficient, but didn't bring a lot of "joy" to the drive. Still, we weren't there for "joy", we were there to collect stuff, annoy the natives, take pictures and videos, and prattle our impressions to the website (one of my first "Twitters" was that we were trying to see if you could skip a Blackberry across English Bay - a bald faced lie from a bearded dude, but an accurate assessment of my feelings about such devices, though as the day wore on I grew to appreciate the PDA and its capabilities). The Vibe handled its chores well, though the MacPherson-strut front suspension and multi-link independent rear suspension (the base model has a torsion-beam rear suspension, while the AWD and GT get the independent buttock slinging) really only got a workout on the Whistler highway. The Vibe's manually-adjustable front seats were great for all-day driving, though since Gerry and I are of decidedly different heights it would have been nice to have power adjustment and memory, but such things aren't generally available on this class of vehicle. The fabric was attractive and the interior offered us so much room that the paraphernalia we collected during the day didn't come close to even requiring us to fold down the second row seats to increase the loading bay's size. The XM satellite radio integrated into the head unit was wonderful; we flipped back and forth through a representative sampling of classic rock (flipping when the inevitable lousy song came on). We didn't really crank it, since we had to communicate with each other, but my initial impression of the premium Monsoon 320-watt seven speaker audio system (optional, though standard on the GT model) is that it's pretty good. The standard system is a four speaker AM/FM/CD (with MP3 auxiliary input) unit. We really only got a quick feel for the Vibe, but it provided efficient and dependable service for our challenges and I look forward to a full week with one sometime soon. As for the Challenge, our Team Flex was in third place when Gerry and I took our leg (another pair of innocent victims took up the challenge the day following) and we managed to snag fourth place by the time we were done, with the fewest points and the fewest online supporters. Guess that means it was your fault for not pushing up our score via the Challenge's online component. Still, the event was a relative blast, and the Vibe acquitted itself admirably. 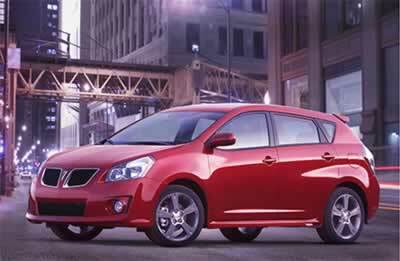 The 2009 Pontiac Vibe starts at just under $16,000 U.S. and Canadian. The AWD model we drove starts at $19,485 U.S./$22,995 Canadian. Seems like a pretty good deal for what you get.